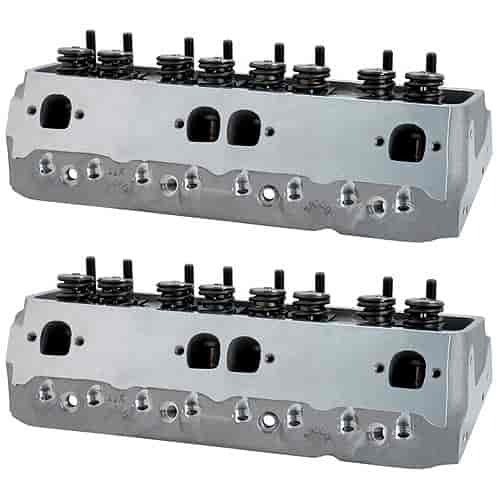 The Brodix Small Block Chevy -11X Series Aluminum Cylinder Heads are available with a standard or spread exhaust port pattern. This 23° head flows 285 cfm @ .700'' lift straight out-of-the-box with as-cast runners and chambers. The BP -11X Series heads feature CNC ported combustion chambers that flow up to 316 cfm @ .700'' lift. Brodix recommends this head be installed on a 400ci+ engine. The -11X requires a special stud girdle and longer pushrods. Piston valve notches must be checked for clearance. A valve length of .150'' longer than stock is required. Every casting is poured from A-356 virgin aluminum and tested before Brodix utilizes their in-house processes such as finish machining and heat treating to assure that you receive the best products for your hard-earned money. The industry standard has been taken to the next level with modernized CNC porting. Other features include a thick deck surface that is compatible with nitrous, drilled and tapped holes on the ends for standard drive accessories, phosphorous bronze valve guides and hardened valve seats installed for unleaded fuel. Sold in Pairs. !